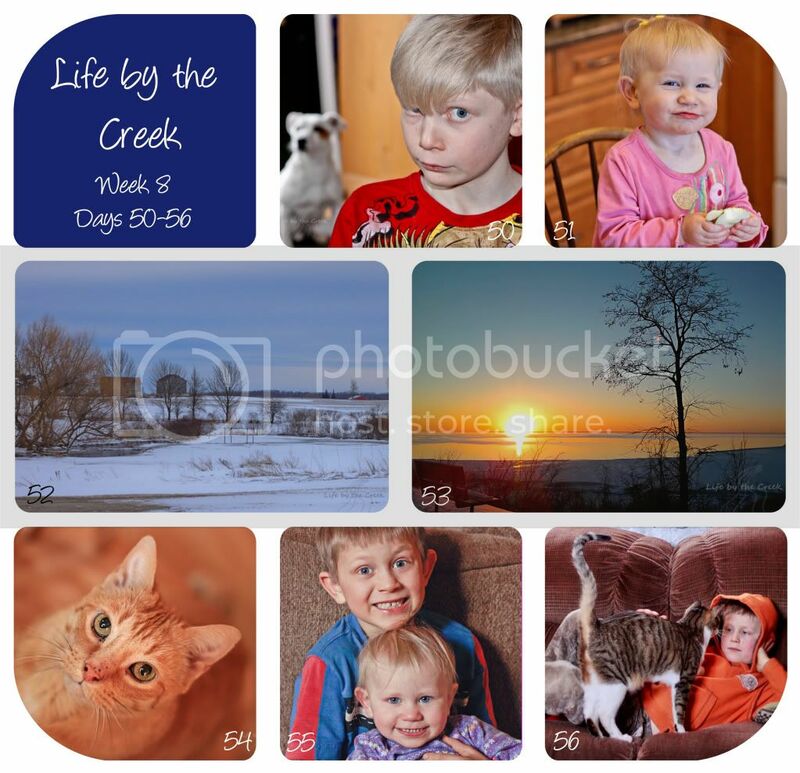 Time for this week’s Project 365 round up! 50. I snapped a bunch of pics of Ethan… and this one was just as he was saying “And now, the brow.” Love that the dog is looking the same way in the background. 51. Hannah’s fake smile. Kills me. 52. More snow for Creekside. 53. Sunset over Lake Huron… taken with my cell phone!!! Gotta love a good cell camera. 54. My cat, Peter. He’s 15 years old. My first baby. I LOVE how this pic turned out. Full size. 55. My two babies. Every time I pick up the camera, they run to get into the picture. And then want to see it immediately. 56. My baby boy was not feeling well – running a fever and no appetite. But he was happy to pet our (huge) kitten! So there you go. That was our week around the creek. Visit Sarah to see more Project 365s. Wow! Wonderful photos. I love them all. Especially 53 & 54. Thanks for linking up. That sunset photo is amazing. Love the contrast of the warm tones of the sunset next to the cool tones of the snow photo. Awesome pictures. Love Hannah, Peter, and sunset. And Ethan. Heck, I love them all! That was my reaction at seeing Hannah's adorable fake smile. Epic, priceless, cuteness-personified, all that jazz. The rest of the photos are awesome as well. Love 52 and 53! Your cell phone camera is awesome. Great collage. I love the expressions on 50 and 51.